Stay away from the South East – IPOB warns President Buhari – Royal Times of Nigeria. 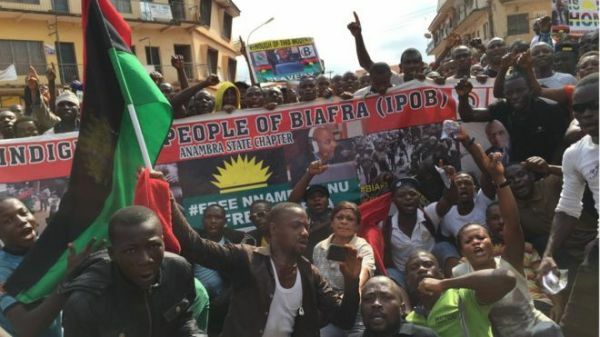 Members of the proscribed secessionist group, Indigenous People of Biafra, IPOB, has released a statement kicking against President Buhari’s planned trip to the South East. In a statement signed by its spokesperson, Emma Powerful, IPOB says President Buhari should forget his planned trip to Ebonyi state tomorrow November 14th and Anambra state on Wednesday, November 15th. The group warned that blood will flow if President Buhari defies their warning and visits the region. “It is with a heavy heart and grave sense of responsibility that we IPOB worldwide under the supreme command Of Mazi Nnamdi Kanu announce to the world, that those who are completely committed to provoking bloodshed in our land may have finally succeeded. The consequences of any fall out from the visit of the impostor Jubril to Ebonyi State will rest squarely on the head of Chief John Nnia Nwodo, Gov. Dave Umahi, Rochas Okorocha and the rest of South East governors. Bringing this version of ‘Buhari’ to insult the memory of those killed at Enugu, Nkpor, Igweocha, Aba, Onitsha and lastly Umuahia will not be tolerated by IPOB and every right thinking Biafran for that matter. This is tantamount to an Israeli politician inviting Adolf Hitler to visit Jerusalem to mock the Jews he slaughtered in Concentration Camps during the holocaust. Tuesday 14th November 2017 will be recorded in history as a very bloody day should that Jubril masquerading as Buhari attempt to land on Biafran soil. We have remained passive and peaceful but it appears that Hausa Fulani slave politicians in Igboland are hell bent on provoking us to become violent. Whoever advised Ohaneze Ndigbo and Igbo governors to embark on this suicide mission does not wish them well. We would like to use this opportunity to call on the Sudanese government to come and return their citizen Jubril, who for months now have been fraudulently and deceptively been parading himself as the hated late dictator Muhammadu Buhari, when in actual fact he is not. That notwithstanding, given that this Jubril have now assumed the persona of the arch gemocidist Muhammadu Buhari, we shall treat him like Buhari. Reason this man, in whose name Operation Python Dance was ordered; an operation that swallowed 91 of our brethren, is visiting Ebonyi state through Enugu airport is best known to Chief John Nnia Nwodo and Gov. Dave Umahi. The impression of a defeated and conquered people being portrayed by the present OHANEZE leadership in concert with the governors of the South East is most troubling at this period in our history. For those that claim to be intellectual elites, their palpable lack of a sense of history showcases their ignorance at every turn. They are planning to welcome a man in the name Buhari, a name that is responsible for the worst war crimes and genocide in recent times against our people. The only atrocity left, for the likes of Nnia Nwodo and Dave Umahi, is for Biafraland to be transformed into a giant estate of the Fulani caliphate, with small labour camps owned by their Emirs, with Biafrans as their labouring slaves. This Jubril person coming in the name of Buhari, it should be noted, is also planning to visit Anambra State on Wednesday 15th November in order to put executive finishing touches to the APC rigging plot to install the caliphate’s latest young Igbo recruit Tony Nwoye. This they hope will cement the ongoing humiliation and conquest of our people. God forbid! Our message is short and simple. JUBRIL a.k.a Muhammadu Buhari will be exposed to the world as the impostor he is by making sure he never goes back alive. We will die with him should he set his foot on the sacred land of Biafra. HE WILL NOT GO BACK ALIVE. He is coming to mock us and to urinate on the graves of our 91 brethren his Operation Python Dance killed in Abia State. He is coming to show us that power belongs to the North and their slaves like Nnia Nwodo and Dave Umahi are in charge over their conquered territory and defeated people of Biafra. He has come to tell us we are forever slaves of his Islamic caliphate. This thing Jubril is only coming to confirm to us that he is our lord and master. WE WILL NOT ACCEPT IT. He can lord it over Ohaneze Ndigbo, Igbo governors and Abuja rent boys but never over we die-hard Biafrans. The Governor that invited him will definitely pay a heavy price, he and his children long after Jubril must have returned to Sudan and Okorocha back to Jos. Buhari the supposed 75 year old blood thirsty nepotistic hater, killed our people in thousands during the 1966 Pogrom. He was with Col Murtala Mohamed at the Asaba Massacre in 1967 in case Chief John Nnia Nwodo and Gov. Dave Umahi have forgotten. He played a key role in all the theatres of genocidal mass slaughter of the Nigeria /Biafra War (1967-1970). He instructed soldiers to kill Nnamdi Kanu at his Afaraukwu Abia State residence 2 months ago. We are yet to know our leader’s whereabouts or that of his parents. This is not the type of person any governor should be welcoming to their land. This blood thirsty Fulani herdsman, holds a world view of Biafrans and Ndigbo in particular as a conquered, enslaved and dominated people. The only reason Buhari sought apex political power was to finish the pledge of Uthman Dan Fodio to dip the Koran in the Atlantic Ocean. He is carrying on the jihad of his forbearer Uthman Dan Fodio propagated by Sir Ahmadu Bello. They hate our people with a passion, they love killing us, so his coming is only to celebrate what he sees as the final defeat of our people. He will not go home alive. All those who plotted this visit will pay dearly. When the time comes their Northern masters will not be around to save them. We see them coming but they will not see us when the time for vengeance comes. Those who are hoping to welcome Buhari to Biafraland will suffer miserably. There will be no forgiveness. We have tried for years to avoid bloodshed, but our enemies have finally provoked us beyond measure. That Nnia Nwodo and Dave Umahi saw it fit to bring this Fulani hater of Igbos from Daura into our land to mock us proves that they are the problem of our people not the solution. We are going to perish together with this ‘Buhari’. It’s a promise”.